Summer is a great time to get ahead on your college essays. 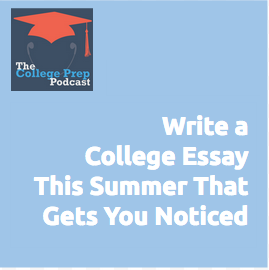 It is definitely possible to write a captivating piece that gets you noticed by colleges in all the RIGHT ways (and none of the WRONG ones). Students will benefit from the tips in this episode, but so will parents and teachers. So often, it’s the adult guidance we give that actually makes essays worse, not better.